Life is Good, Especially when you have moments like this one! I did not know what I was after or where I was going as I drove away from home… so I followed the light and it led me across the Hood River Bridge where I had a lovely afternoon among orchards and pastures. Please ask before using any of my photos, but you may certainly share by sending the link to my pages to your friends! I share them on here but I also partly make my living from this ability to do photography. Also I enjoy knowing where they get used, it makes me happy. You can find out more about me and the products I have available on my profile on Flickr, and on this website in the various Page links in the side bar to the left. My Daughter known as Leannan Sidhe who is a singer songwriter in the style somewhat of Enya. Please keep my daughter’s music and my photography products in mind this year for Christmas Present ideas! She has lovely albums, clever hats and clothing, and a short story in an anthology, and i have PHOTOGRAPHY! bet you did not guess! Almost done with my 2013 calendar, as the 2012 one was a big hit last year. 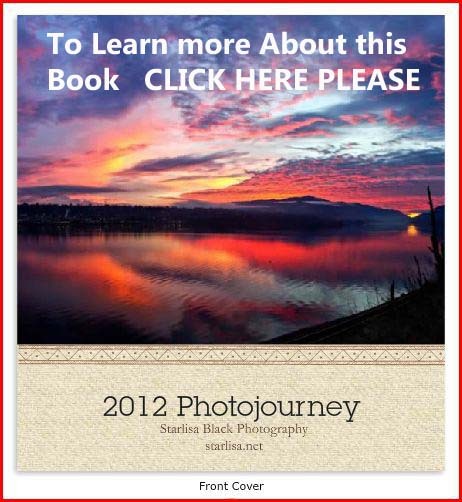 I have several photo books now, you can see pages on my website showing photos from the books. I currrently have a show up still at The Inn of The White Salmon which is a wonderful place to stay in White Salmon, Washington with easy access to both Mount Hood and Mount Adams as well as the Columbia River Gorge. My show will be coming down soon and…on the Last Friday gallery walk in November I will be putting up a show at Solstice Wood Fired Cafe in Bingen, WA and there WILL be a gallery opening event that evening, so come say hello! ANYTIME: contact me via email at starlisa.black@gmail.com or phone or facebook message or talk to me if you see me around town… I have 3 different books currently on hand, “Trout Lake and Beyond” “Moods of Mount Adams” and “Pacific Northwest” all of which are shown in detail on pages listed in the sidebar to the left. I will soon have a 2013 calendar also which sold out quickly last year and I have already presold at least 12 already! The CALENDAR will be $20 this year, and I am taking pre orders now. I also have lots of photo cards of this area and of the Cascade Creek Fire, as well as 8 x 10 images and many larger prints of really popular images. This year the Metal Prints have taken off in popularity.. they are amazing and will last forever. I recently did a portrait 20 x 30 on metal and it was lovely! I created a page on here for my newest photobook Trout Lake and Beyond, with a full album of images from each page from the book. Come and see! 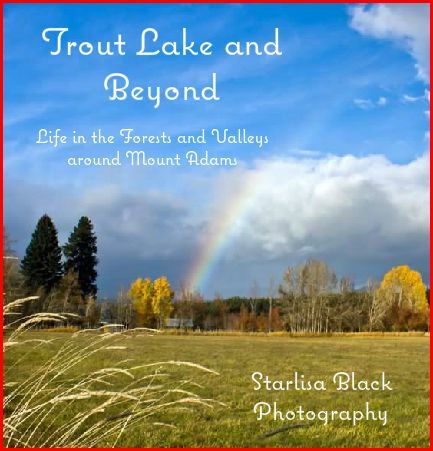 Photo Book, Trout Lake and Beyond.